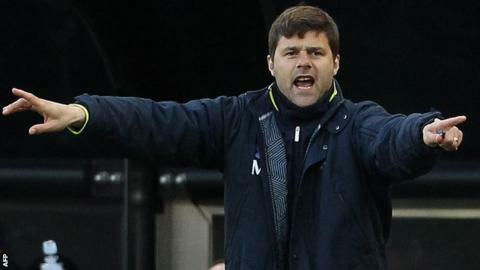 Tottenham manager Mauricio Pochettino expects to have the final say on his club's transfer targets this summer. Technical director Franco Baldini, chairman Daniel Levy, head of recruitment Paul Mitchell and chief scout Ian Broomfield have previously been involved in transfer activity. But Pochettino wants overall control on the identity of new players arriving at White Hart Lane. The Spurs boss said: "The final decision? I think it should be me." Tottenham are sixth in the Premier League, seven points behind Manchester United in fourth. They are likely to miss out on Champions League qualification which could mean a number of changes to the playing staff this summer. Former manager Andre Villas Boas, who was sacked in December 2013, was reported to have been unhappy with some aspects of the club's transfer policy during his time in charge. Pochettino, who became Tottenham manager in May 2014 after Tim Sherwood was dismissed, added: "The manager and the coaching staff need to deal with the player, in the changing room or on the pitch and if the feeling is not good between us it is difficult to achieve something. "It is very important that the players who stay here and who we bring in that I agree and it is my decision. "If you bring in some players and I don't know them, maybe they are not bad players, but the feeling the player has with the coaching staff or the manager is important."